Will Melisandre return with an army to save the day? 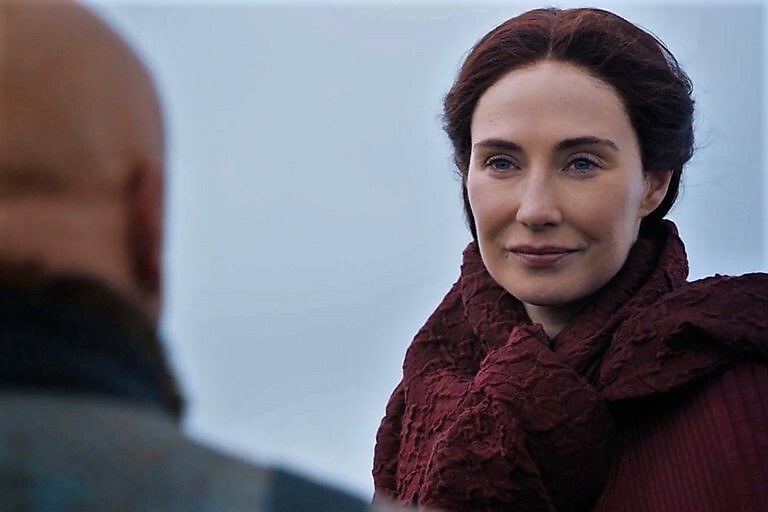 When we last saw the Red Priestess Melisandre in Season Seven she told to Varys that she was going to sail across the Narrow Sea to Volantis, "I will return, dear Spider, one last time. I have to die in this strange country, just like you." Volantis is home to one of the largest Red Temples in the religion of R'hllor, and also happens to be where Kinvara—the Red Priestess we met in Season Six—is from. IKinvara met with Tyrion and told him she believed that Daenerys is the Princess That Was Promised. She also agreed to convince her people to follow Daenerys, which is great news, because she's kind of a big deal where she's from. Considering they're both going to converge in Volantis and they're both part of the same crew and they both believe in Daenerys' cause, it's safe to assume Melisandre and Kinvara will team up. Volantis is guarded by a massive army called the Fiery Hand, which Tyrion sees in A Dance With Dragons. An army that follows a fire god sounds pretty useful in a battle against ice undead monsters who are vulnerable to fire.